ETHICAL EASTER GIFTS - sophia. Our Ethical Easter Gifts mean that you can be guilt free! ​Easter is just around the corner and we can't wait to celebrate with you! We're super excited to overindulge on chocolate, spend time with family and friends and spread the love this holiday! We've created the best collection of eco-friendly and conscious gifts so that you can still spoil your family without all the guilt. Our hand designed cards are the perfect accompaniment to our gorgeous Easter platters and Easter egg baskets. Crafted with an enormous amount of love and 100% recycled materials, each piece in our Easter collection is sure to be a crowd pleaser! Our customers love our unique and handcrafted copper Easter egg baskets and our brightly coloured Easter platters which look great when piled high with hot cross buns! It's important to celebrate this time of year in the most conscious and eco-friendly way so try to opt for zero waste wrapping and remember that aluminium foil from Easter eggs can be recycled! All you have to do is roll it into a large ball and put in your recycling bin. It's only possible for recycling centres to re-utilise it when it's bundled together though so keeping all the wrappers together is vital. ​We're in love with the fresh autumn air and excitement of Easter morning and we know that it's a special and beautiful time to spend with family and friends. Because of this, we wanted to put together a few special Easter projects just for you. These include DIY projects, recipes, styling/decorating ideas and zero waste Easter inspiration! Enjoy trying them out and try not to eat too much chocolate! 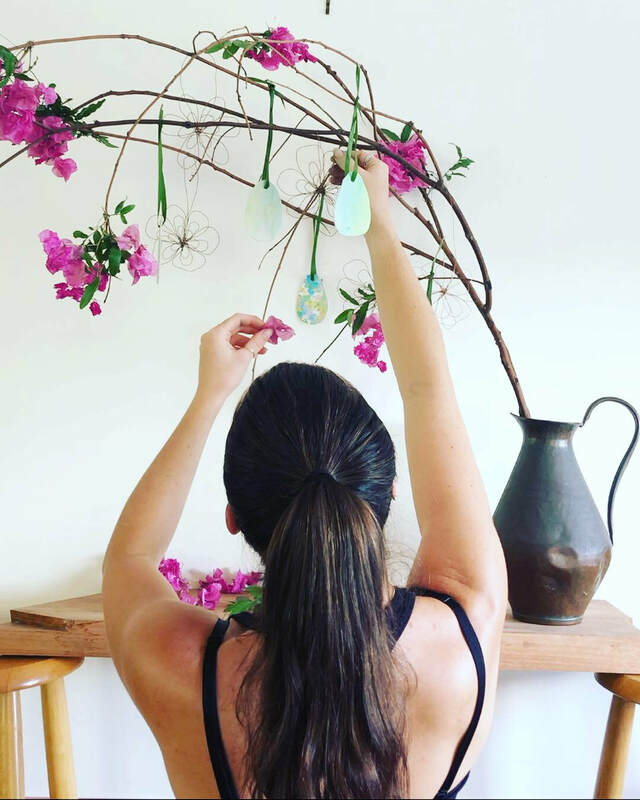 ​Decorating at Easter time is so much fun because there are so many gorgeous flowers in bloom and plenty of other beautiful and natural materials to forage from the garden. 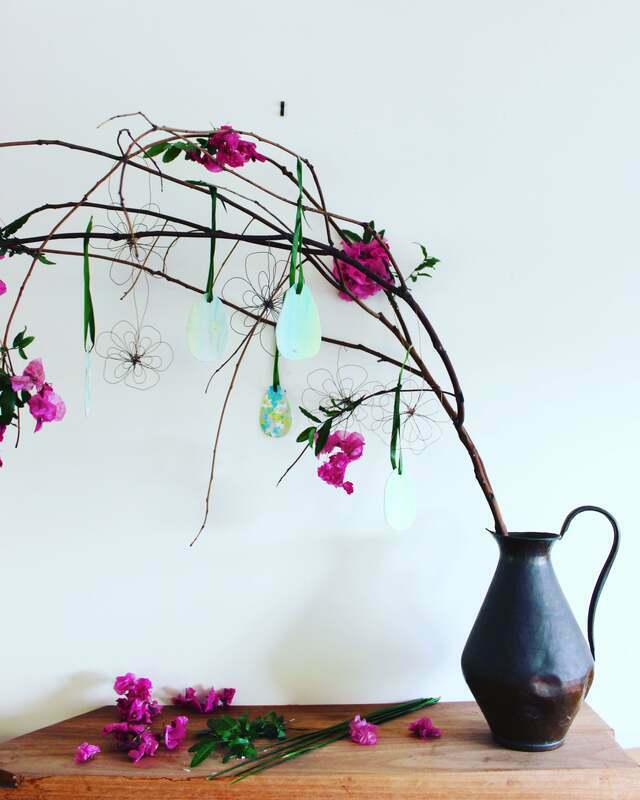 To make your own decorative easter branch, all you need is a few simple materials and your imagination! - A large, dead branch that you've found in your garden or the local park - the more twigs the better! Place your branch inside the vase and steady it by placing rocks in the bottom (the branch we used was a camphor laurel). First place your Sophia. copper decorations on different sections of the branch, then use your selected plants and flowers (we used pink bougainvillea and leaves called Ocna because they both hold their colours even after they're dead) and tie little posies to other pieces of the branch. We also created our own Easter egg ornaments by dyeing scrap cardboard with food dye, cutting out the shapes, hole punching them and then attaching them to the branch by using long strips of palm frond. Get creative with your decorations and use what you have around you! Don't forget to tag @sophia.mulheran.designs on Instagram so we can see your creations! 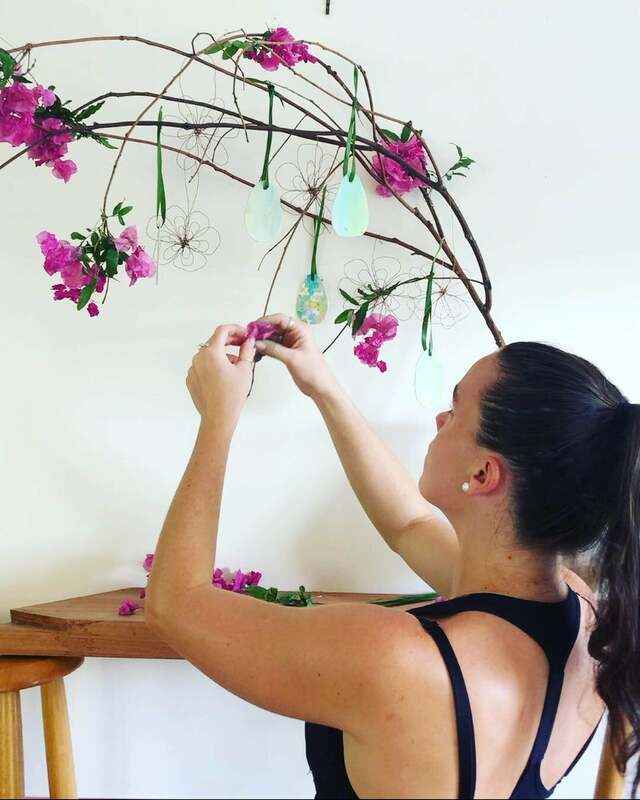 An Easter Branch is such a simple way to add colour and creativity into your home and the best part is that you can create it to suit your style. Once it's finished, place it in the centre of your dining table for every one to enjoy! It's no surprise that Easter comes with a lot of unnecessary waste and packaging and we have the perfect solution - zero waste Easter eggs right from the purchasing of the ingredients to the wrapping of the chocolates! We have teamed up with The Source Bulk Foods in Bulimba for this project and it wouldn't have been possible without their incredible support! Firstly, head to The Source with your re-usable bags and containers and grab a selection of package free white, milk and dark chocolate chunks. Cut your edible flowers (try to get a colourful variety of petals) into small pieces and place in the bottom of the ice cube trays or chocolate moulds. Next, place a saucepan over low heat and melt one of the types of chocolate (we started with white and finished with milk). Once the chocolate is completely melted, fill the bottom half of the moulds with the chocolate and place in the fridge to cool. In the meantime, melt the next batch of chocolate and fill the moulds the rest of the way. Place moulds/ice cube trays in fridge to completely set. Prepare your fresh nasturtium leaves by chopping the entire stem off right at the base and cut grass stems into 30cm lengths. Take the chocolates out of the fridge once solid and pop them out of the moulds and into a small bowl. Then, take one chocolate at a time, place it into the centre of the nasturtium leaf, bundle the chocolate up and then tie together with grass stem. Display your zero waste chocolates on one our our Easter Platters and then scatter flower petals and bright green leaves through the middle. These will be an absolute crowd pleaser as they not only look gorgeous, they also taste delicious. Don't forget to tell your guests that they're completely waste free from start to finish! This is such a fun activity for all ages and once again, we've made this project entirely zero waste! If done properly, these decorated eggs will last for generations, you just have to make sure you store them properly between Easters! Firstly, hold your egg over a bowl and poke a hole in the thin end of the egg with the sewing needle then poke a larger hole in the other end of the egg. Use the toothpick to break the yolk up inside the egg. Use your re-usable straw to blow through the small hole and into the bowl below. Repeat these steps with all eggs and set aside bowl of egg yolks and whites for an omelette afterwards! Once all of your eggs are empty, place them in hot, but not boiling water along with your materials for natural dyeing. One saucepan for each of your desired colours. If you want to skip this step, you can also use non-toxic paints to add colour to them. 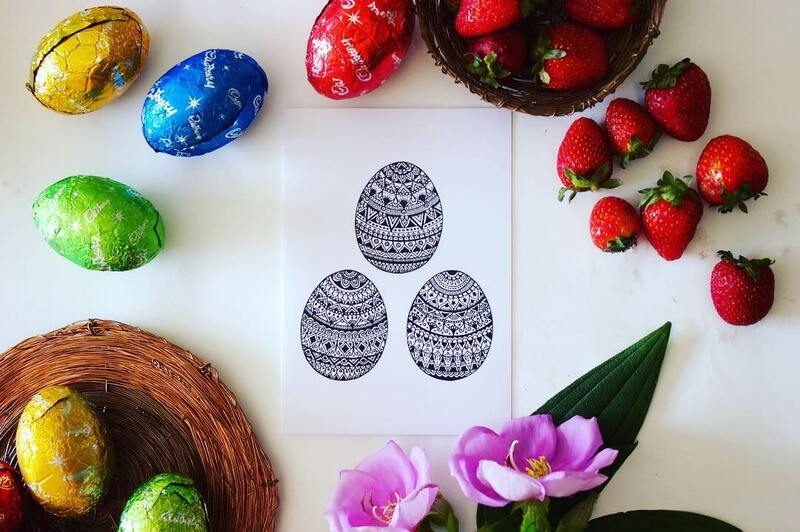 When all the eggs have been dyed, set them aside on a paper towel to dry and then use your pens to decorate the outside with patterns and drawings. Make sure you're really gentle as you're decorating as the eggs can break easily. Once all the decorating is complete, use the needle to guide a piece of ribbon through the hole of the egg and out the other side. Tie a knot so that the ribbon stays in place and so you can hang them on your Easter branch! If you'd prefer not to have them hanging, display them in one of our Copper Bowls instead and place them in the centre of your table. To store, wrap in recycled tissue paper, place in an old shoe box and leave in a cupboard until next year!